If your company is using cloud resources or publishes their OnPrem Resources to the Internet then most of you just use Username/Password or probably Multifactor Authentication (MFA) for Authentication? To securely publish OnPrem Resources you are using Reverse Proxies in your DMZ? If you answer these questions with yes then, you must read this blog. Some of the solutions you use are easily to configure, but mostly they need some OnPrem Systems, which therefore require regularly updates and new investments in hardware. Additionally, you must keep in mind, that it is not enough to have two reverse proxies for redundancy, you then need also a redundant load balancer and redundant internet connections. If you put all of this together then you see, that you have very hight cost and probably not always the newest technology. Today, I assume, you will give access to resources based on AD Groups. If a user is in the group, then he has access. Is that enough for the future? I have customers which had security breaches with stolen credentials. Therefore, the attacker has access to all resources, where the user has permission for. With Conditional Access, you can block that, because you can include User Risk State, Device Compliance or Location to the Access Rule. 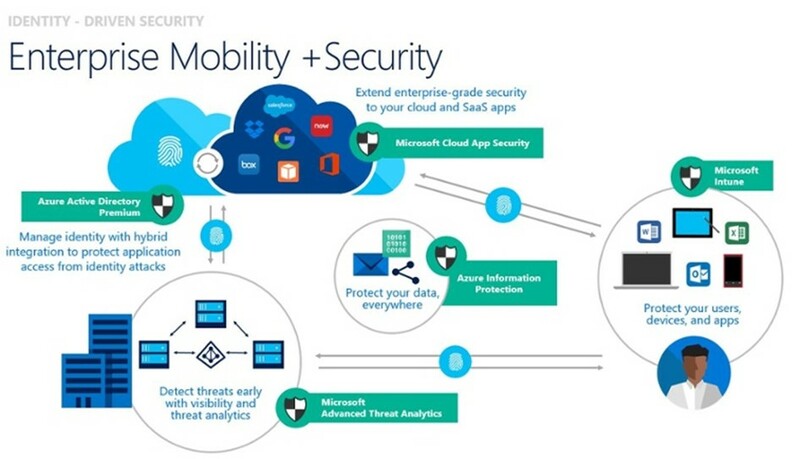 I will explain the possibilities in more details in the Conditional Access Blog Post. The users can manage group memberships on their own for groups they own or just manage their own memberships for open groups or applications. Additionally, they can use Self Service Password Reset to Reset their own Password with various verification options. Another option is to provide them access to the Bitlocker Recovery Key. Last week a customer told me, that he is evaluating Identity Management Systems and that they are very expensive. Then I just asked, why he is not looking at the Microsoft Identity Manager, which can do all of his planned things, like syncing employee data from SAP to Active Directory and other systems. The answer was: “This product was too expensive!” Hmm, he already owns EMS, so he can use it already with no additional cost. Azure Information Protection – Protect Date wherever they are, not only on the encrypted notebooks. AIP allows you to encrypt and limit access your document based on Labels, which can automatically be applied or manually chosen by your users. The documents can be opened with all newer Office versions. Therefore, most of the external recipients don’t need an extra piece of software, like with other solutions. So, it is end user friendlier than most of the other solutions. Read more about it in one of my earlier blog posts. With Intune, you have great solution to manage your mobile devices or also your Windows 10 devices. If you need more options to manage Windows 10, then have a look on our extensions in the Syntaro Portal. In this few examples, you could see how much issues Microsoft EMS can solve. It is a big toolset and will also help you in some questions regarding to the new European General Data Protection Regulation (GDPR). In regards to GDPR, you find a lot of useful information also on the Microsoft Blog. As soon I have more experience from the field to share, I will to that.